Do my guests need to be 21 years of age? No. Your guests can be any age and still enjoy the excitement and fun of a casino party. Do we play for real money? No! No real money is to be used on the tables. At the start of the event, each guest is given a predetermined amount of funny money or play chips that can be exchanged at the table of their choice for game chips. The object is simple, have lots of fun while trying to win as much as possible by the end of the event. Once the party is over, your guests will cash in their chips for either funny money or raffle tickets. Although not necessary, often times the Casino Host will have prizes available at the end of the Casino Party. Winners of the event can be determined through either a raffle drawing, an auction, or by simply rewarding the top chip earners. If prizes are going to be awarded, they are generally provided by the Casino Party host. If you prefer to have an auction at the end of your Casino Party, our dealers will gladly help your guests count their winnings and pose as auctioneers. What if a guest runs out of chips? The Casino Party Host will be provided with an unlimited amount of vouchers, chips, or funny money to offer their guests. If a guest runs out of game chips, all they have to do is seek out the Casino Host and request more. The Casino Host is welcome to hand out vouchers, chips, and funny money as they please. Remember, the main idea behind a Casino Party is that all of your guests have a great time. If you are having a fundraiser for your special cause, then additional vouchers or game chips would be purchased from the Casino Host in the form of an additional donation. This will vary based upon how the fundraiser has been setup. A typical Casino Party will last between 2 – 4 hours. Often times, you’ll notice your guests are having so much fun that you’ll want to keep the party going a little longer. Simply notify the on-site Casino Manager and your party can be extended as long as you would like. 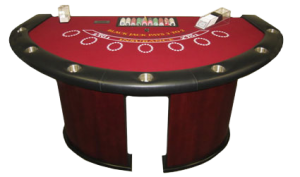 We offer the most popular table games found in Las Vegas. These include Black Jack, Craps, Roulette, all forms of Poker, including Texas Holdem. We can also set up a money wheel and slot machines to enhance the Casino experience. In addition, we have several other unique ideas that can really spice up your Casino Party. Click here for a list of ideas! How do we decide which games would be best for our party? This is a quick and easy process; please click here to view our game recommendations. You can also call us at 317-821-7130 in Michigan to talk to one our Professional Casino Party Planners and they will be more than happy to make recommendations for your Casino Party. What if our guests don’t know how to play the games? All our dealers are accustomed to dealing with both experienced and inexperienced players and are eager to teach the games to everyone. We can also provide an information table with brochures at your event that explain the fundamentals of each of the games your casino party offers. Brochures on how to play each game are available in a PDF downloadable format in advance to help with your casino party planning by clicking here. Online instructional videos on how to play each of our casino games is available by clicking here. What do my guests do with all of the chips at the end of the party? At the end of the Casino Party, your guests will turn in all of the chips they have won at a designated location. If prizes are available, participants will receive either funny money or raffle tickets that can be used to win them through either a drawing or an auction. In some cases, prizes are simply awarded to the top game chip earners. What are some great ideas for prizes? ~It should be something the majority of your guests would want. ~The prize should have a recognizable brand name associated with durability and a positive reputation. ~Gift certificates to major stores, Prepaid MasterCard / Visa Debit Cards, & American Express gift checks, can also make great prizes. ~Restaurant gift certificates also make great prizes. Please keep in mind that these type of certificates are usually more worthwhile if they come from a more upscale restaurant. ~If you are trying to watch the budget and still want to give away some great prizes, things like movie passes, lottery tickets, and video rentals will work great. ~And of course, we can’t forget the most up to date electronic gadgets. Your guests will love these. Tipping is well appreciated by all the dealers, but is not mandatory. All of the dealers know to provide excellence service whether they are tipped or not. If you wish to include a tip for the dealers, please talk to your Casino Party Manager and they will explain the best way of going about it. When do we setup and tear down our equipment? Our team will work with you and the location for your Casino Party in order to determine the best time to setup. We will deliver everything and setup well before the start of your event so your guests get the full Casino Party experience when they arrive. How do I book a Casino Party NOW? You can book a Casino Party by Request a Quote or contact us by telephone by calling 317-821-7130. We are excited about working with you and look forward to help you with your casino party planning to make your next casino party a special event.